" Google Home is a voice activated home product that allows you and your family to get answers from Google, stream music and manage everyday task. " 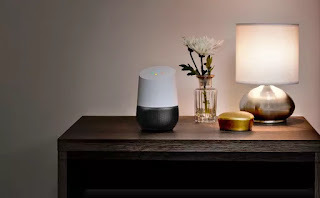 so, Google Home is a wireless speaker and voice command device that is always on and can connect to smart devices and provide real time information. Just plug it in and start asking questions, play desired music, assign it some task and even it can control home automation devices of your home. Amazon had already launched this type of device in 2014 with the name Amazon Echo. It is very popular. So, Google Home is ready to give a tough competition to Amazon Echo. For starting interaction you have to say " okay, Google " to the device. You can ask question and it will answer you. It can control many devices at your home. You can control Google cast and Chromecast with it and you can easily watch your favourite YouTube videos on your TV and listen to Google play music. By structure, Google Home is a cylindrical object with an angled top. It contains a modular case so that you can choose the base shell that will match the color of your walls. It has LED lights that will look like dancing, it confirms that device is working. It can cover multiple room of your house with that facility to sync with more than one Google Home device. At first, we come to the price. Amazon Echo is available at $180. But, Google Home's price is not announced yet. 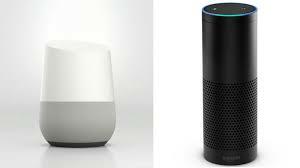 Both devices respond to voice commands and are always listening. You can wake Amazon Echo by saying " Amazon " or " Echo " . Google Home will wake up by saying " okay, Google ". Google Home has customizable appearance. You can choose the base shell that will match your house decoration. Amazon Echo doesn't have customizable appearance. Google Home has multiple room support. More than one Amazon Echo device can't sync with each other. But, Google Home can sync with each device kept in different rooms of the house. Amazon Echo can't respond to questions outside the established commands. But, Google Home is powered by Google search engine. So, friends ! Just wait and watch, when it is releasing and with what price Google Home comes in the market.